You'll be £25.00 closer to your next £10.00 credit when you purchase The Railway - British Track Since 1804. What's this? 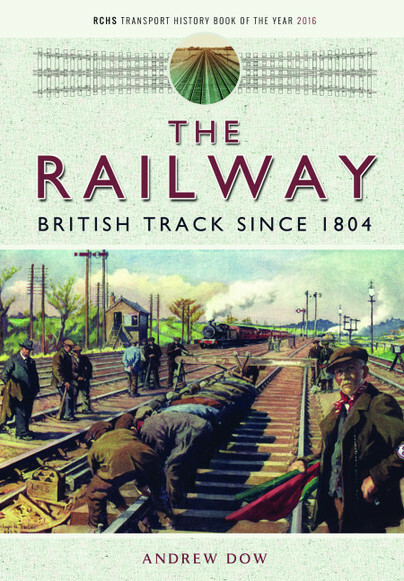 Never before has a comprehensive history been written of the track used by railways of all gauges, tramways, and cliff railways, in Great Britain. And yet it was the development of track, every bit as much as the development of the locomotive, that has allowed our railways to provide an extraordinarily wide range of services. Without the track of today, with its laser-guided maintenance machines, the TGV and the Eurostar could not cruise smoothly at 272 feet per second, nor could 2,000-ton freight trains carry a wide range of materials, or suburban railways, over and under the ground, serve our great cities in a way that roads never could. Andrew Dows account of the development of track, involving deep research in the papers of professional institutions as well as rare books, company records and personal accounts, paints a vivid picture of development from primitive beginnings to modernity. The book contains nearly 200 specially-commissioned drawings as well as many photographs of track in its very many forms since the appearance of the steam locomotive in 1804. Included are chapters on electrified railways, and on the development of mechanised maintenance, which revolutionised the world of the platelayer. I would never have thought that such a trivial subject would be so curious, interesting and impressive. I would never have thought that such a trivial subject would be so curious, interesting and impressive . An essential masterpiece in our railway library. This massive tome is the swan-song of a late author who was once Head of the National Railway Museum at York. It is not about railways primarily but a comprehensive history of the track on which they ran. This is a volume which could become a standard reference work on its subject. It is likely to have wide appeal and will be useful to professional railway personnel, railway preservationists, modellers of railway in all scales and anyone involved in trains and track irrespective of gauge. The prevalence of ‘British’ railway methods throughout the world means that it is also likely to have international appeal to readers where these practices apply. A fascinating and readable volume. I assumed it would be just another book outlining the basics of railway track in simple terms. How wrong I was when I saw the superb tome that Andrew has created! At 458 pages it is clearly a massive labour of love on Andrew's part and a fitting epitaph to his very successful career in railways. ... It has been my great pleasure and privilege to review this excellent book which is a great credit to Andrew Dow. As featured in The Newcomen Society Western Courier Newsletter of the Western Branch this book is a comprehensive and detailed history the railway and development from tram road to the modern era. The author guides us through a huge subject and is a monumental work beautifully produced with nearly 200 skilled and clear drawings, and numerous photographs of track. A must read for all railway and transport enthusiasts alike. Written in well researched, semi-technical format, typeset for easy reading, and featuring every facet of the permanent way from 1804 to date, in sixteen chapters plus appendices including tramways and cliff lifts...An excellent book and definitely a five star volume. A major, important new book of British railway history. The range of topics covered, including research results, are impressive. The illustrations are well selected and reproduced. Highly recommended. Author Andrew Dow and Pen & Sword Books have done the world of railway knowledge a huge service in the producing this commendable tome. Some enthusiasts may take track for granted or consider it fairly 'unexciting' but this book will show them what they've been missing! The first comprehensive account of the history and development of railway track of all gauges including tramways and cliff railways...It will widen the readers knowledge of railways considerably...Authorative and highly recommended. Andrew Dow was born into a railway family in 1943. He joined Bristol Siddeley as a Commercial apprentice in 1962, and after holding various internal positions in 1975 he became Chief Commercial Administrator for the Viper engine in the HS125 business jet, based in Millville, New Jersey. He was then appointed Commercial Manager for the Pegasus engine, based in Bristol, on the eve of the launch of the AV-8B Harrier II programme. He was thus deeply involved with the US Marine Corps and McDonnell Douglas, but he also dealt with the Spanish and Indian Navies on their Matador and Sea Harrier programmes. In 1991 he left aviation to become Head of the National Railway Museum, and in 1994 he joined the railway industry. He has written four books, three about railways and one, Pegasus: the Heart of the Harrier, about aviation, and published by Pen & Sword.